M1 – Feels like 5.5 climbing. M2 – Feels like 5.6 climbing. M3 – Feels like 5.7 climbing. M4 – Feels like 5.8 climbing. M5 – Feels like 5.9 climbing; using the blades of ice axes in cracks to torque and dry-hook is useful. 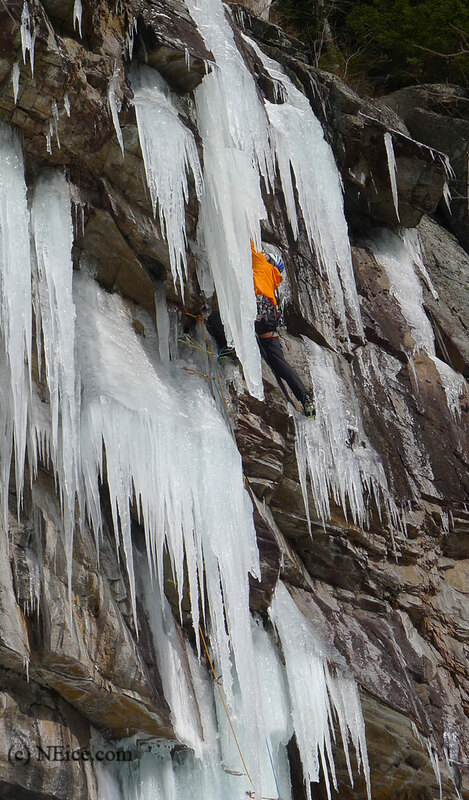 M6 – Feels like 5.9+ climbing; using the blades of ice axes in cracks to torque and dry-hook is mandatory. M7 – Feels like 5.10 climbing; using ice axes and crampons in such a way as to make the climb impossible without them. Usually somewhat overhanging. M8 – Feels like 5.11 climbing; using ice axes and crampons in such a way as to make the climb impossible without them. Involves overhanging and sustained climbing. M9 – Feels like 5.11+ climbing, using ice axes and crampons in such a way as to make the climb impossible without them. Involves severely sustained and extremely overhanging climbing. WI 1 – Easy, low-angled ice. Walking up ice where crampons are necessary. The easiest ice for which a belay rope would be used. A basic level of technical expertise for safety is required. General angle: 50 degrees. WI 2 – Moderate, low-angled water ice with short bulges. Good protection and anchors. Front-points of the crampons may or may not be required. General angle: 60 degrees. WI 3 – Steeper water ice, with longer bulges. Some continuous front pointing but with good resting places between. Generally good protection, screws can be placed from comfortable stances. The ice is usually of good quality. Requires adeptness at placing protection and making belays. General angle: 70 degrees. WI 4 – Sustained climbing with some vertical sections, separated by good belays. The ice may have some technical features like chandeliers but generally the quality of ice is good and offers secure protection and belays. Usually demands that screws be placed while on vertical or near vertical ice. General angle: 80 degrees. WI 5 – A long, steep, strenuous, columnar pitch of ice. Sustained difficulties with little opportunity to rest. Expertise in dealing with the different ice formations is required (e.g., chandeliers, cauliflowers, candled sections). Adequate protection requires effort to place. The climb may sometimes be run-out above protection. Belays may be difficult to create and/or hanging. General angle: 90 degrees. WI 6 A serious lead on severe and/or thin ice. Long vertical and/or overhanging sections, extremely sustained difficulties. Few, if any, resting sites. Ice may not be of the best quality, often thin, chandeliered and hard to protect. Expert technique and a powerful, positive mind frame are prerequisites. Hanging belays of dubious quality may be required. General angle: 90+ degrees. WI 7 Ice that is very thin, long, overhanging or very technical. Free-hanging columns of dubious adhesion. This grade requires creative techniques to climb and to find protection. Protection may be non-existent. A very physical and emotional pitch. Total commitment is required. Belays require a very high level of expertise, and may be marginal at best. 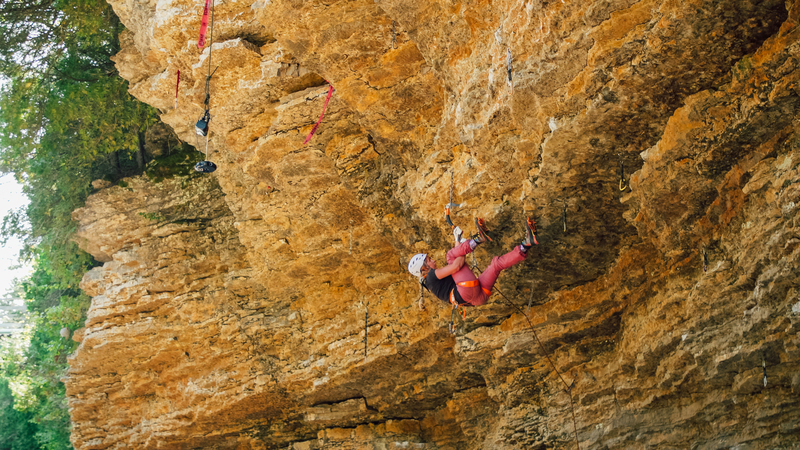 This grade applies to only a handful of routes led by an even fewer number of world class climbers. WI 7 is the outer space of ice climbing. General angle: 90++ degrees. A/C1. Straightforward aiding; secure gear and lots of it; little chance of falling. A/C2. More involved aiding; minor traverses and/or overhangs; secure gear and lots of it; length of potential fall from crux is short. A/C3. Technical aiding; traverses and/or overhangs; gear less than optimal; climbing may be thin with run-outs above secure gear; somewhat lengthy potential fall from crux. A/C4. Very difficult technical aiding; major roofs and/or traverses; poor gear with long run-outs; length of potential fall from the crux may be as long as a full pitch. A/C5. Involves aid climbing which defies death; a fall would be onto the belay or the ground. ** a plus sign (+) or a minus sign (-) may be used within a(n) A/C grade to indicate a greater or lesser degree of difficulty, respectively. A protection rating indicates the spacing and quality of the protection available, for a well-equipped and skilled leader. PG13 – OK protection, falls may be long but will probably not cause serious injury. I. Route which may be completed in a matter of a few hours. II. Route which may be completed in half a day. III. Route which may require an entire day. IV. Route which may be done in a very long day by a fast team, but a bivouac may be needed by teams of average speed. V. Route which will require at least one bivouac on the route. May require two or three days to complete the route. VI. Very long alpine climb taking as long as a week to complete.